Maintaining indoor air quality is essential in many buildings including offices, workplaces, schools and public buildings to ensure the wellbeing of occupants. Carbon dioxide data loggers, in conjunction with temperature and humidity loggers, can play an important role in helping to verify that indoor heating, ventilation and air conditioning systems are performing correctly: areas with inadequate ventilation can lead to a build-up in CO2 levels and poor air quality, which in turn can cause reduced concentration and productivity in occupants and in some cases can lead to health problems. Monitoring temperature and humidity will help ensure appropriate comfort levels, preventing conditions becoming too hot or too cold. Both can result in discomfort and reduced performance in occupants: overheating can lead to tiredness and even headaches, while cold conditions can cause unpleasant sensation in extremities and shivering. Oxygen is breathed in, and carbon dioxide exhaled. Outdoors, CO2 levels usually range from 350-450ppm (but are higher in areas with very heavy traffic). Indoor CO2 levels are therefore generally higher than outdoors, and typically vary between 400 and 1200 ppm. Levels are affected by the number of occupants in the room, the activity levels of occupants, the amount of time occupants spend in the room and the ventilation rate. By measuring indoor CO2 levels, air quality can be maintained by finding the balance between the carbon dioxide that humans produce and a 'dilution effect' as ventilation systems operate. The CO2 content is used to identify and control the amount of fresh air per person in a room. By using the known difference between indoor and outdoor CO2 concentrations, and by monitoring indoor concentrations of carbon dioxide, ventilation performance can be determined. In the UK, HM Government Building Regulations covering the control of ventilation state that "It is important that ventilation is controllable so it can maintain reasonable indoor air quality and avoid waste of energy", and go on to mention that using CO2 detectors can be one means of achieving this. Specific regulations exist for school buildings. Building Bulletin 101 (BB101): The Ventilation of School Buildings - specifies that ventilation should be provided to limit the concentration of carbon dioxide in all teaching and learning spaces. In the absence of any major pollutants, carbon dioxide is taken to be the key indicator of ventilation performance for the control of indoor air quality. During the continuous period between the start and finish of teaching on any day, the average concentration of carbon dioxide should not exceed 1500 parts per million (ppm). In addition, based on the recommendations of the Health and Safety Executive, it suggests that the maximum concentration of carbon dioxide should not exceed 5000 ppm during the teaching day, and that at any occupied time, including teaching, the occupants should be able to lower the concentration of carbon dioxide to 1000 ppm, although these levels may not be suitable for areas such as science laboratories and food technology rooms etc. The guidelines suggest using CO2 sensing as a means of assessing ventilation performance, possibly in conjunction with temperature monitoring control to provide night-cooling control, and to limit excessive heat loss in winter. This approach has been used in schools in England and Wales, and also in Europe, where more specific guidelines often exist for monitoring carbon dioxide levels in buildings other than schools. For example, in Denmark, carbon dioxide is measured to check whether the ventilation is sufficient for the room compared to the number of people that are going to use it. The Labour Inspectorate in Denmark recommends an upper limit of 1000ppm with the recommended value for school classrooms is 1200ppm. In Sweden and many other countries, 1000ppm is the recommended maximum level, with several Swedish companies recommending a maximum level of 800ppm for peak staff performance. 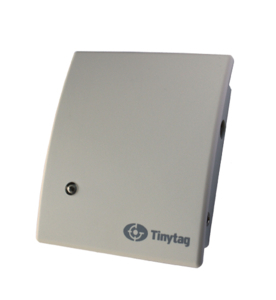 There are two Tinytag CO2 data loggers, which have been designed to monitor in different areas with varying concentration levels, reflecting the guidance and recommendations above. The TGE-0010 monitors up to 2000ppm, while for more specialist areas or applications, the TGE-0011 monitors up to 5000ppm. Both units have a user-defined upper ppm limit, and if this limit is reached a flashing red LED will be activated. CO2 loggers, in conjunction with temp/RH loggers, can be used for many applications to monitor air quality, and has included university research into air quality and energy system performance in a wide range of buildings.